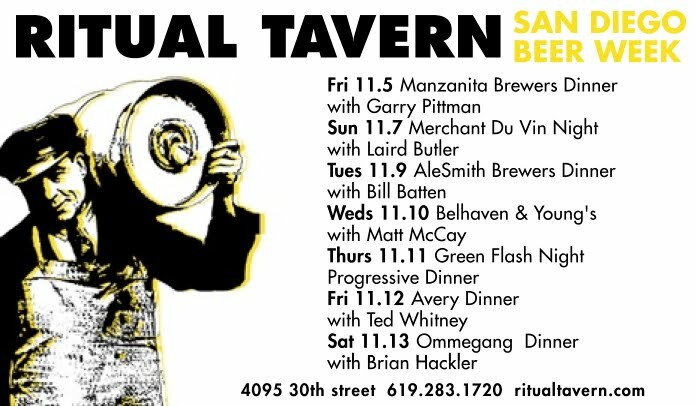 Ritual Tavern is gearing up for 10 days of craft beer in America's Finest City! Saturday 11/6 We'll be at the San Diego Brewers Guild Festival in the VIP lounge serving up food from noon to 2pm. Ritual Tavern opens regular hours 5:30 for your dining and craft beer pleasure. Sunday 11/7 Featuring beers of Merchant Du Vin and Samuel Smith Brewery with importer representative Laird Butler. No reservations necessary. 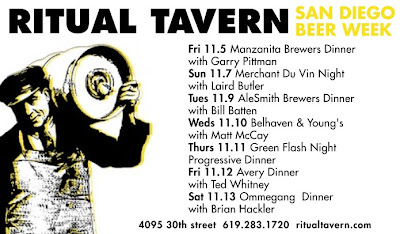 Tuesday 11/9 AleSmith Dinner & Paring with brewer Bill Batten. Four courses paired with 4 beers. Likely to sell out, please RSVP soon. Wednesday 11/10 Scottish, English and Belgian beers paired with food. Order one or all pairings, no reservations required. Live music from Trio Gadjo and it's DrinkAbout too! FREE Brewery Tours of San Diego bus transports you up and down 30th St.
Thursday 11/11 Green Flash Progressive Dinner/Pairings. 3 potential small plate pairings at each participating location. Join us here at Ritual Tavern, Linkery, El Take it Easy, also Sea Rocket and Blind Lady Alehouse too! No reservations necessary. We look forward to spending Beer Week with you!